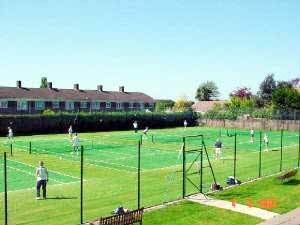 Association Tennis, squash, racket-ball, fitness (multigym), short tennis for children. Junior tennis. Junior squash. Tennis & squash group lessons for members and local schools. Professional tennis coach and professional squash coach. Fitness instructor for multigym. Aerobic classes. Two bars, 2 snooker tables, restaurant and social functions with live groups and discos. age. Social membership starts at £36 per annum, playing memberships range from £126 junior to £630 family, but all fees are now gold card so there are no additional payments for courts fees. The men's singles winner receives £575,000 (~$USD930,000), while the women's winner gets £535,000 (~$USD865,000). In 1968, the year of the first "open" championships, the prize money was £2,000 and £750, respectively. There will be approximately 200 ball boys and girls running around the courts at this year's event. The Great Pyramid of Cheops, Cairo: It took 10000 workers over 20 years to build the Great Pyramid of Cheops, located just outside Cairo in Egypt. About 6.5 million tonnes of stone were used!